Psychotronica Redux | from "Abbott and Costello Go to Mars" to "Zotz!" from "Abbott and Costello Go to Mars" to "Zotz!" Generally, when I think of director Robert Wise, West Side Story and The Sound of Music immediately spring to mind (as I’m sure they do for most movie buffs). I really can’t explain why this is, because a) I’m not a fan of musicals and b) I’ve seen enough of Wise’s movies to know that he tackled a whole lot of different genres and made a whole bunch of great films. It most probably has a little to do with both of those previously-mentioned films winning the Best Picture Oscar. Being Psychotronically-inclined, however, I should know better. Eight of Wise’s films are listed in The Psychotronic Encyclopedia of Film, and several of those are bona fide classics. Wise made three science fiction films during his long career: The Day the Earth Stood Still, The Andromeda Strain, and Star Trek: The Motion Picture. The quality that unites all three films is that they were made for adults, unlike the majority of science fiction movies. The distinction that sets The Andromeda Strain apart from the other two, and apart from the vast majority of science fiction films, is that it’s considered a “hard” science fiction film. Hard science fiction is a subgenre that emphasizes the “science” part of science fiction. Normally, I’m not a big fan of science fiction and fantasy films. Usually, the magnitude of the suspension of disbelief that I have to muster is just too great, and I end up finding the whole affair contemptuous. (For proof, just check out my write-up of Altered States.) Now, if you throw a monster in there, well, it’s a different story…but ordinarily, science fiction is not my go-to genre. Because of this bias, I really expected to dislike The Andromeda Strain the first time I saw it years ago. However, the film’s sheer plausibility plus its relentless forward momentum kept it from feeling less like a science fiction film and more like a horrifying Discovery Channel documentary. My second viewing of the film for this post only strengthened my feelings about it. For those of you who haven’t seen it yet, The Andromeda Strain is about an organism that’s brought to the American Southwest by a returning satellite. The satellite crashes near the small town of Piedmont, New Mexico, and the microbes that it carries kill everyone in town…except for an old man and a baby. A team of scientists is quickly assembled and charged with figuring out how to contain and/or destroy the code-named Andromeda Strain before it kills more people. It’s based on a novel by Michael Crichton which, while not his first novel, was the first of his novels to be published under his own name and the first of his novels to be a best-seller. Apparently, the shape of the LP, while not affecting its playback (as the grooved part of the album still had circular grooves), caused a lot of problems with automatic record changers. 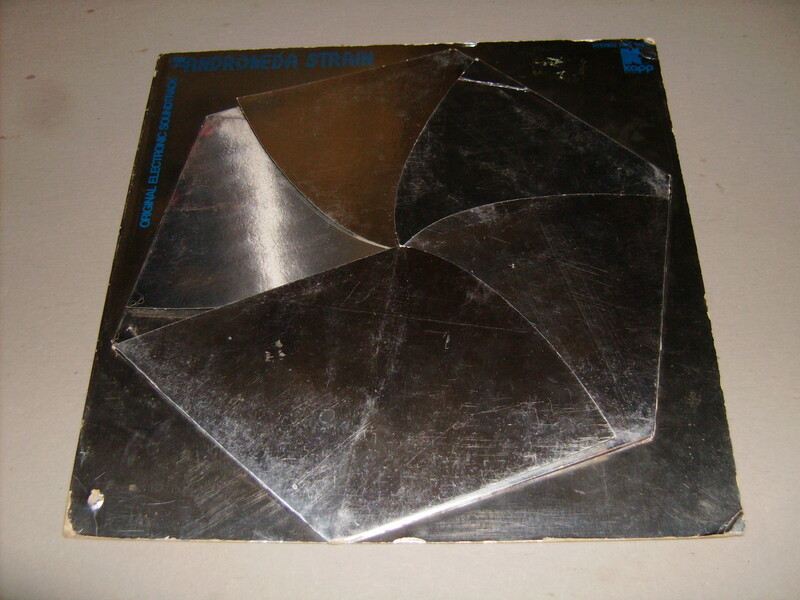 Everything probably would have been fine if the grooved portion of the album had been the normal twelve inches in diameter; however, to fit the hexagonal shape into a standard-sized album cover (which would fit in standard-sized display bins in stores), the grooved part of the LP was only 10 inches in diameter. Automatic record changers were designed to gently set the tone arm down at a point six inches from the spindle of the turntable, so when this album was played, the tone arm would then be beat mercilessly by the decidedly UNcircular sides of the vinyl. 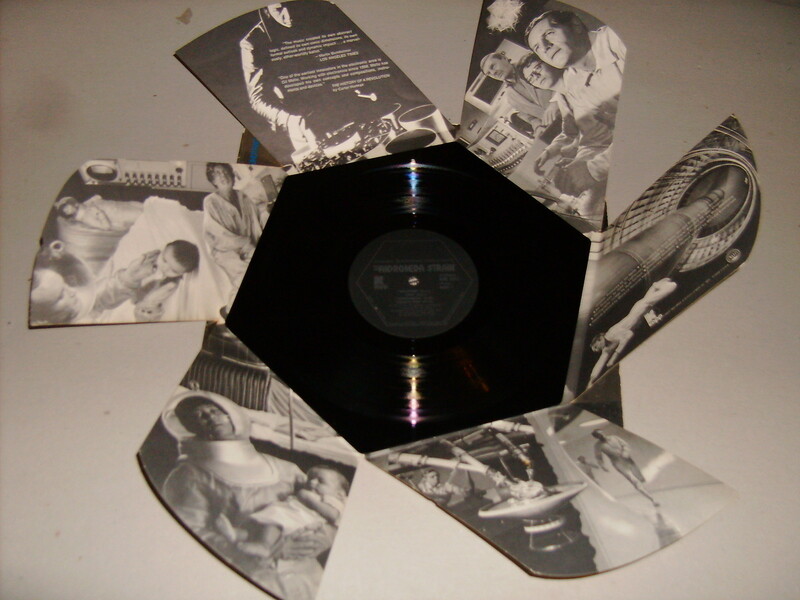 As Michael Weldon puts it in the Psychotronic Encyclopedia, the unique design of the LP “caused untold destruction to the nation’s automatic turntables, whose cartridges were smashed by the record’s corners.” Actually, though, although some damage WAS reported, it was far less than “untold,” as the soundtrack didn’t sell well at all. After the reports of damage started coming in, Kapp Records recalled the soundtrack and repressed it onto good, old-fashioned circular vinyl. It still didn’t sell, however. Because the soundtrack didn’t move a whole lot of copies, it’s rather rare today; in fact, a copy of the hexagonal edition sold for $125 on eBay only a few days before my posting of this write-up. 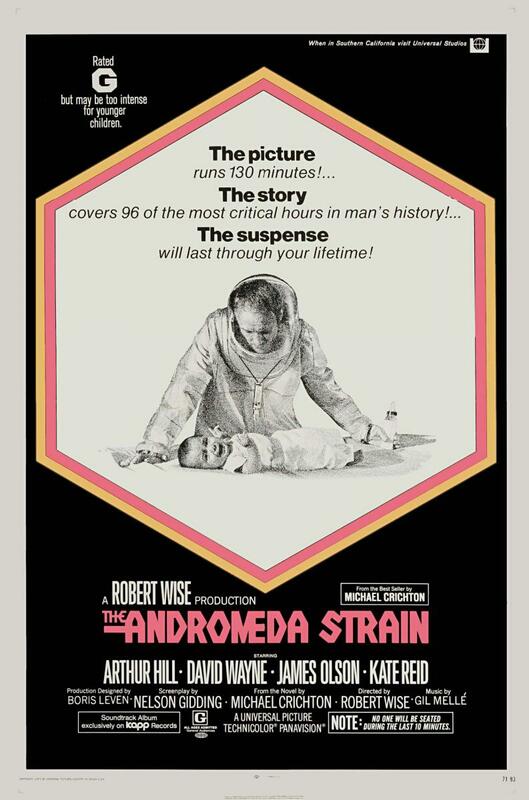 Check out The Andromeda Strain when you get a chance. It’s science fiction for those who don’t usually like science fiction. And if you decide, after watching it, that you want a copy of the soundtrack…I suggest that you buy the CD. Up next: Murder a la Warhol! Eight people get invitations from a stranger to take a holiday at a mysterious island mansion, but once they get there, they start dying, one by one. Is the mysterious host killing them off? Is one of the guests actually the host? Will any of them survive the trip? 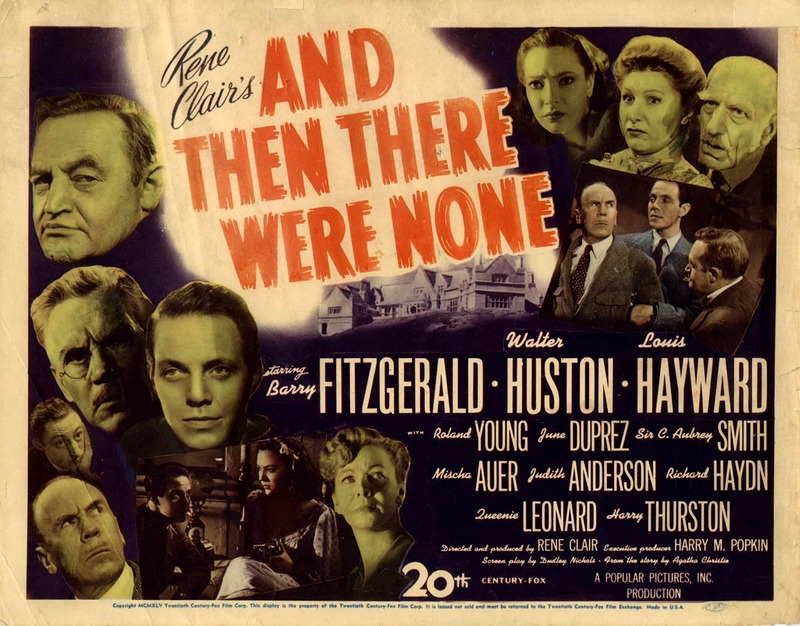 And Then There Were None is based on Agatha Christie’s novel (and later stage play) Ten Little Indians. In the film, there are ten ceramic Indian figures on the dining room table, and as each guest (and two servants hired for the occasion) is killed, one of the figures is shattered by the unseen host. There’s also the sheet music to the song on the piano, which is played and sung by one of the guests (Mischa Auer, who was absolutely hysterical as Carlo in My Man Godfrey in 1936). In case you’re not familiar with the tune (and it’s NOT the “One little, two little, three little Indians” song), it starts with ten Indian boys, and each verse tells how one of them dies, counting down until there are no Indian boys left alive. The murders at the house follow the same basic pattern as the song; the first Indian boy in the song chokes to death, and the first victim of the unknown killer drinks poison and dies. And so it goes, the murders echoing the way the Indian boys died, in the order in which they appeared in the song. And Then There Were None has been officially remade at least three times, and it’s been unofficially remade about a gajillion times. I bet that you could probably name two or three films off the top of your head that feature story elements that show up here. A mysterious host invites several people to spend the weekend at his house? William Castle’s House on Haunted Hill. A murderous madman keeps wax heads of the nine people he’s targeting, and after he’s killed them, he melts each wax head with a blowtorch? The Abominable Dr. Phibes. Equally as relevant as those two examples, And Then There Were None is also probably the first example of the so-called “body count” movie, in which a mysterious someone spends the majority of a film’s running time killing off the rest of the cast. Even though Mario Bava’s charmingly-titled Twitch of the Death Nerve (a.k.a. A Bay of Blood) usually gets the credit for setting the body-count film’s template, it’s pretty obvious that it was modeled on And Then There Were None, just as Friday the 13th and its sequels were modeled on it. As is often the case with big-studio movies made in the ‘40s, the cast is uniformly great. In addition to the aforementioned Mischa Auer, the film stars Barry Fitzgerald (Going My Way), Louis Heyward (The Son of Dr. Jekyll, Terror in the Wax Museum), Roland Young (the Topper films), Dame Judith Anderson (unforgettable as Mrs. Danvers in Hitchcock’s Rebecca), June Duprez (hubba! ), and several more great character actors. My favorite actor in the film is Walter Huston, who was so incredibly perfect in The Devil and Daniel Webster that I vowed to watch all of his films. He certainly didn’t disappoint me this time, either. And Then There Were None is unbeatable entertainment that I can’t imagine anybody who is willing to give it a fair shake disliking. This is another film to put near the top of your “really need to get around to seeing” list. Up next: A visit to Piedmont, New Mexico! While taking a cycling holiday in France, two young British nurses, Jane (Pamela Franklin) and Cathy (Michele Dotrice), catch the eye of Paul (Sandor Elès), a mysterious stranger on a motorbike. He follows them for a while as they tour the countryside, but he never speaks to them or even acts particularly interested in them. After he disappears, Cathy decides to take a rest in a woodland clearing by the road. Jane, not wanting to waste too much time, is ready to leave after a little while, but Cathy decides that she wants to stay longer. After an argument, Jane decides to go ahead, with Cathy promising to catch up to her later. After waiting for a while, Jane decides to go back and get Cathy, but when she arrives at the spot where Cathy had been, there’s no sign of her. As she’s looking around, Paul shows up and offers his help in finding Cathy. But can Jane trust him? Even though director Robert Fuest (The Abominable Dr. Phibes) had directed a previous film and had worked on the Avengers television show as both a production designer and a director, he said that he really feels like this was his first film, as it was the first in which he felt like he knew what he was doing. Speaking of The Avengers, practically all of the key creative people on And Soon the Darkness had come from that television program. When production on The Avengers wrapped up, director Fuest, writer/producer Brian Clemens, writer Terry Nation, producer Albert Fennell, and composer Laurie Johnson all segued into working on this film. The film is sort of odd in that it’s both very much of its time while seeming rather ageless. Laurie Johnson’s theme music is brassy and upbeat and, at first, doesn’t seem to fit well with the tone of the picture at all, but it’s a memorable piece of music that stuck in my mind long afterwards and helped cement the film in my memory. The rest of the score is quite good, with some very Bernard Hermann-esque passages popping up every once in a while. Even though it’s not a giallo, the tone of the film seems to me to be very much akin to that of Dario Argento’s The Bird with the Crystal Plumage, which was made at about the same time. What I really love about the film is its first thirty or so minutes. The scenes with the two nurses riding their bicycles down deserted country roads seem to perfectly capture the dreamy, lazy mood of hot, still afternoons in the country. I also really appreciate Fuest’s decision to keep all of the French spoken in the film unsubtitled, so that the audience is just as much in the dark as to what’s being discussed around Jane when she’s looking for her friend as Jane herself is. (I have to point out that, if you do indeed speak even a little French, there’s an enormous clue given by one of the characters as to who the film’s bad guy is.) Another aspect of the film that sets it apart from other thrillers is that the events of the film take place over only six or seven hours and, even more rare, the whole film takes place during daylight hours. Think long and hard–when was the last time you saw a thriller that took place entirely during the day? I’m coming up blank. And Soon the Darkness was remade in 2010, with two American girls cycling their way through Argentina. I’ve avoided the film, especially since it a) had a very limited theatrical release only two weeks before it came out on DVD and Blu-ray, and b) was only able to muster a 17% fresh rating on RottenTomatoes.com. Those are two pretty strong reasons for skipping it, as far as most people are concerned. But check out the original And Soon the Darkness if you get a chance–it’s a nice change of pace from the usual cookie-cutter thriller. Someone’s posted a video to YouTube that features the film’s theme song set to still images. It starts out moodily enough, but you’ll soon hear what I meant when I described it as brassy and upbeat. (It also reminds me, for a reason I can’t really fathom, of the theme from Roger Corman’s The Trip. Maybe it’s the brass instrumentation.) The audio sounds like it was ripped directly from the DVD, which must be the case, as I haven’t ever heard of an official soundtrack album being released. Also, try not to watch the stills that accompany the music, as at least one of them gives a bit too much away about the fate of poor, missing Cathy. And, as is most often the case, YouTube comes through with a trailer. This time, it’s the British theatrical trailer. Enjoy! Up next: Ten Little Indian boys go out to dine! Okay, in all fairness, I should point out that the screaming that’s starting in the title is actually that of Stephanie Beacham, the star of the film, and not that of the viewer. Now that the “truth in advertising” disclaimer is out of the way, the plot, in a nutshell, has to do with Catherine (Beacham) marrying Charles Fengriffen (Ian Ogilvy) and moving into his house. What Charles forgets to tell her is that there’s a curse on the house, but she finds evidence of it pretty quickly…as in two minutes or so after entering the house. The curse has something to do with Charles’s grandfather, but no one will actually tell Catherine what the curse entails…although there’s this disembodied hand that keeps crawling about, and a facially-birthmarked woodsman keeps popping up at inopportune moments. And Now the Screaming Starts!!! is based on a novel by David Case called Fengriffen. I haven’t read the book, as I couldn’t seem to find a good used copy for under $40. I did, however, find a book called The Mammoth Book of Short Horror Novels that contains it, so I’ve ordered it. It should be in sometime soon, but I figured that I’d go ahead and get this post up anyway. If you’ve seen a fair number of British horror films, you should recognize The House instantly: it’s a place called Oakley Court that has been used in several Hammer films (such as The Plague of the Zombies), the oddball film Girly, and, most famously, The Rocky Horror Picture Show. It was sold in 1979 and reopened in 1981 as a luxury hotel. If you want to see what it looks like today, and perhaps book a room while you’re at it, you can do that at the Oakley Court, Windsor’s website here. I find the film to be quite entertaining, but it is let down a bit by a fairly stupid ending. Still, it’s a very good-looking and professional production. Pretty much everyone involved with the film had already been active in horror films: Stephanie Beacham had just been in Dracula A.D. 1972; Ian Ogilvy had starred in all of director Michael Reeves’s credited films (The She-Beast, The Sorcerers, and Witchfinder General [a.k.a. The Conqueror Worm in America]); Patrick Magee had been in horror films since Francis Ford Coppola’s Dementia 13 in 1963; Herbert Lom had been, among many other horror roles, Hammer’s Phantom of the Opera; and Peter Cushing’s along for the ride, too–and sporting quite the foppish haircut. Director Roy Ward Baker was no stranger to horror films either, with And Now the Screaming Starts!!! his third film in a row for Amicus, after Asylum and The Vault of Horror. Before those, he’d helmed several productions for Hammer, including the space western Moon Zero Two and The Vampire Lovers. And before ALL of that, he’d directed Marilyn Monroe in Don’t Bother to Knock and had made the best Titanic movie until James Cameron came along, 1958’s A Night to Remember. Now, a few words about Amicus. Amicus Productions was formed somewhere around 1960 by two Americans, Milton Subotsky and Max J. Rosenberg. The company was based in England and, while they produced all sorts of films, they became best known as producers of horror anthology films such as Torture Garden, The House that Dripped Blood, and Tales from the Crypt. These films usually starred many of the same people who showed up regularly in Hammer films, leading to some confusion as to which films were made by which production company. (Here’s a way to help keep ‘em at least a little straight: Hammer never made an anthology film.) 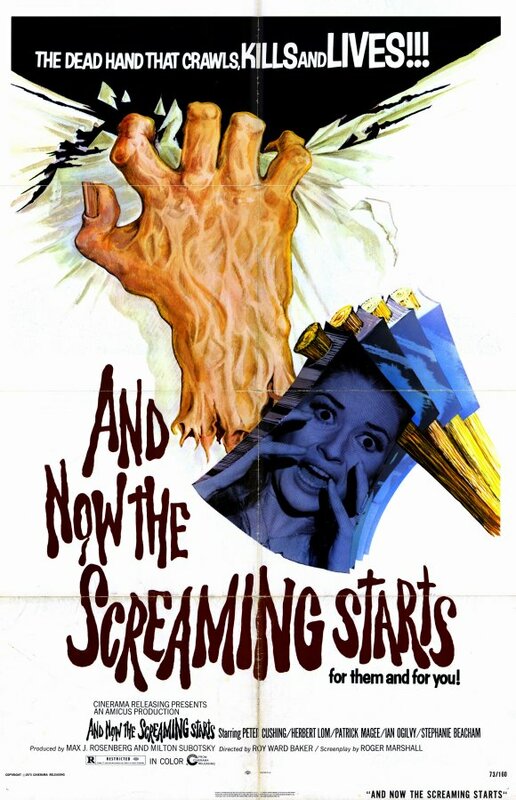 While the majority of Amicus’s output in the horror genre was anthology films, they also made some single-story horror features as well, such as And Now the Screaming Starts!! !, The Beast Must Die, and The Skull. If you were a horror movie kid growing up in the early ‘70s, Amicus films were must-sees. I saw several of them in the theater, but I didn’t get to see this one, as it’s one of their rare features to be rated R.
Up next: British nurses go bicycling in France! Chet Marco has problems. His brother has just been executed for murder, his sister is dating the son of the man whose testimony sent his brother to prison to begin with, and his girlfriend isn’t much interested in him anymore. He’s also bent on getting revenge on everyone who had a hand in sending his brother to jail, since his brother claimed that he was innocent of the crime. What unfolds is a fairly standard JD picture, with the added bonus of a revenge scenario thrown into the mix. Let there be no doubt, however–Chet IS a psycho. You can tell by the way he stares into the camera sometimes and by the humongous scar on his face that he got from a guy wielding a broken bottle in a street fight. While it’s certainly not the worst film ever made, Anatomy of a Psycho doesn’t have a whole lot going for it, either. The title is an obvious ploy to sucker in folks who liked the previous year’s hit Psycho while perhaps planting a subconscious tie to an equally popular film from 1959, Otto Preminger’s Anatomy of a Murder. Although it takes a while before Chet starts doing really psychotic things in Anatomy of a Psycho, he eventually gets there, but the climactic scene is a real cop-out. The film has lapsed into the public domain (well, to be truthful, it might never have been copyrighted in the first place), which means that there’s not a really pristine copy of this floating around out there. The copy that I saw had really muffled audio. Cast members that you might recognize include Ronnie Burns, Jack and Gracie’s adopted son (who was featured in a whole bunch of episodes of their TV show); Pamela Lincoln, who was in William Castle’s The Tingler a couple of years before this; and Don Devlin, who had bounced around AIP for a few years prior to making this and was featured in such films as Blood of Dracula and Operation Dames (and whose son, Dean Devlin, was one of the writers and producers of the unfathomably awful 1998 Godzilla cinematic atrocity). Probably THE most recognizable thing about this film, however, is that it uses some of the same music cues that Ed Wood used in Plan 9 from Outer Space. I found this aspect of the film to be particularly disorienting. Oddly enough, there’s a rumor going around that Ed Wood helped write the film. Take that as you may. Up next: The dead hand that crawls, kills, and lives!!! Somewhere off the coast of Argentina, a “sea devil” has been terrorizing pearl divers. When the mysterious creature (who is actually a man in a mermaid-like getup) saves Gutiere, a beautiful young girl, from being eaten by a shark, he falls in love with her. Unfortunately, she has been promised to the loathsome and coarse Don Pedro Zurita, who vows to capture the sea devil and make him dive for pearls. To call The Amphibian Man a science fiction film is really a bit too limiting, yet most of the time that’s the category into which it’s lumped. Rather than being science fiction, the film is much more a fantasy or, even more specifically, a fairytale. Its lone nod to science fiction is that the title character, whose name is Ichthyander (and those of you who are spelling bee fans should be able to figure out what his name means–he’s, quite literally, a fishman), underwent surgery to save his life when he was very young. As his father the surgeon puts it, “I replaced part of his lung with the gills of a young shark.” So Ichthyander has both gills and lungs, making him able to live both on land and in water. But there’s a caveat (and isn’t there always, in fairytales?) — if Ichthyander stays too long in the water without breathing air, it’ll mess up his lungs somehow, and he’ll be forced to live underwater for the rest of his life. 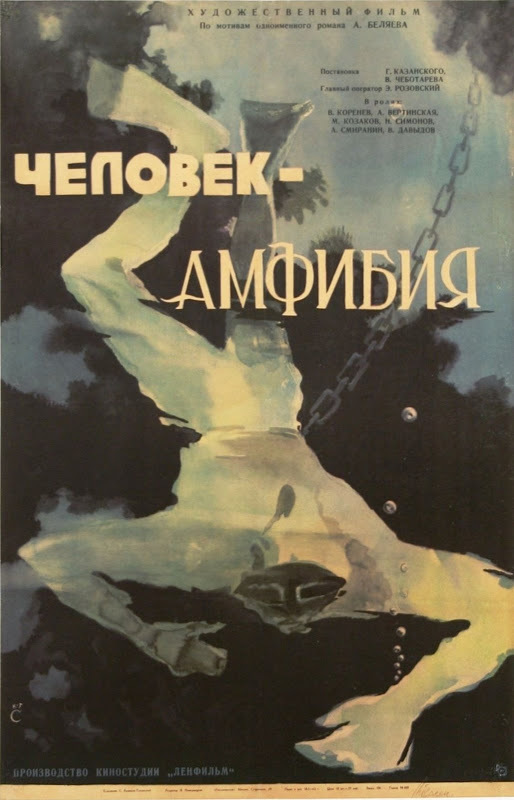 The Amphibian Man was based on a novel by Alexander Belyaev (or Belayev, depending on who’s doing the translating from Cyrillic) which was originally published in Russia in 1928. Belyaev’s claim to fame is that he was the first Russian science-fiction writer, and he’s usually mentioned as one of the best. Not being up on my Russian science fiction (I opted not to take that class in graduate school), I couldn’t tell you if that’s true. The film itself was a pretty high-profile production in Russia, and from what I can gather on the Interweb, it was one of the biggest hits of 1961. It seems to hold roughly the same place in the hearts of Russia’s citizenry as The Wizard of Oz does in American hearts. That success didn’t translate to America, however, as the film ended up being sold directly to television, where it ended up in a package of films from NTA (National Telefilm Associates) which included other science fiction films such as Neutron Vs. the Amazing Dr. Caronte and The Wizard of Mars. I doubt that this has shown on television in the last twenty years, but you never know. I have to wonder whether the scene where Ichthyander saves Gutiere from the shark was chopped up a little bit or darkened somewhat for television, as the top half of the swimsuit that she’s wearing goes so transparent when wet that it leaves NOTHING to the imagination. I just can’t imagine that going over too well on TV in the mid-sixties. The film’s production values are quite handsome, the music score has some very pretty moments, and the color (at least on the DVD that I watched) is eye-popping in places. Vladimir Korenev (or William Koren, as he’s known in the TV print’s Anglicized credits), the actor who plays Ichthyander, looks as if he were chiseled into being rather than being born the old-fashioned way. Michael Weldon, in the Psychotronic Encyclopedia, gets the plot wrong in his one-sentence summary (“An evil scientist tries to kill a young man with gills.”). Or, you can even watch the entire film here (but it’s in its original Russian with no subtitles of any kind, so be forewarned). Among the Living is a nifty B picture from Paramount that, while not a horror film per se, has a lot of connections to the horror genre. In it, a man returns to his hometown to bury his recently-deceased father and take over the family business. While there, he finds out that his crazy twin brother, whom he and everybody else had believed to have died when he was ten, is actually still alive and being clandestinely kept and cared-for in a hidden basement room of the family mansion by the loyal family servant. As luck would have it, the insane twin kills the servant and escapes only minutes before the good brother goes to retrieve him. The rest of the film deals with the good twin trying to find the mad twin before the police find out about him and/or he kills again. Let’s just say that he isn’t entirely successful in his endeavor. Now, about Among the Living’s horror connections: director Stuart Heisler made Among the Living for Paramount right after finishing The Monster and the Girl (also for Paramount); top-billed actor Albert Dekker had played the titular role in the previous year’s Dr. Cyclops (at Paramount, of course); and fourth-billed Frances Farmer was just two years away from beginning her real-life horror story. The strongest link to the horror genre, however, is provided by the writers. Brian Marlow, who co-wrote the story of the film, had written Supernatural, the Halperin Brothers’ follow-up to White Zombie. Lester Cole, who co-wrote both the story and the screenplay, had written The Invisible Man Returns for Universal the previous year. The real star of the writing staff, though, was co-screenwriter Garrett Fort. Fort had a hand in writing some of the ultra-classics from Universal’s so-called “Golden Age of Horror,” including Frankenstein, Dracula, and its sequel, Dracula’s Daughter. He also wrote MGM’s The Devil Doll for Dracula director Tod Browning. So, with all that horror-associated talent both in front of and, especially, behind the camera, Among the Living easily earns its spot in the Psychotronic Encyclopedia. Here are a few things to look for as you watch the film: Susan Hayward shows up in an early role as a girl with questionable motives (a film noir staple– this is another of those films that definitely qualifies as a proto-noir) who befriends the crazy twin; you might recognize Maude Eburne, who plays Susan Hayward’s character’s mother, from The Vampire Bat (and then again, you may not); and last and most definitely least, if you look closely when the insane twin walks by a movie theater, there’s an ad outside the theater for one of director Stuart Heisler’s previous films, The Biscuit Eater. Among the Living is a largely forgotten film from the heyday of Hollywood, and it’s a shame that more people don’t know about it. It’s even more of a shame that nobody (and by nobody, I mean Universal Studios, which owns most of the pre-1948 Paramount films) has ever seen fit to release it to the home video market in the United States (although I’m willing to bet that tripe like the Olivia Newton-John stinker Xanadu has never been out of print since its initial release over 30 years ago). But that’s a rant for another day. Up next: a Russian guy with gills! Unpopular Culture Bringing the world the best of the worst! My other blog.